Adapt this sample sales resignation letter for your own use. 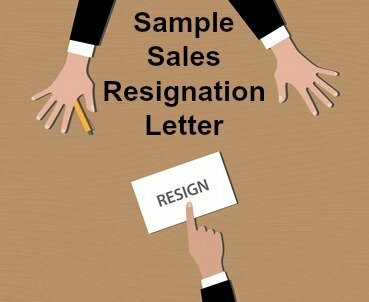 This letter of resignation includes all the necessary details, is both positive and polite and allows you to leave your sales job in a dignified and professional manner. It is important to maintain good relations with previous employers. You may need to get a reference from your ex-employer, companies network and negative information will be passed around quickly and your letter of resignation will stay on your employee file. Keep your resignation professional and cordial. Please accept my resignation of my position as Sales Representative effective March 15, 2019. My last day of employment will be Friday March 29, 2019 which includes the required two weeks notice period. I have thoroughly enjoyed working at ABC Company under your direction, but I now find that I have an opportunity to further develop my career in keeping with the long term goals I have set myself. I have appreciated the chance to develop my sales skills while working with such a positive team. It is largely due to the valuable experience I have gained working for ABC that I am now able to pursue this growth opportunity. I am committed to effectively servicing my accounts during the next two weeks and to minimize any inconvenience to our clients. I am willing to assist in any way to make my departure as easy as possible for the sales department. Please let me know if there is anything specific you would like me to do. I would like to thank you for all your support and encouragement over the last X years/months. I wish you and the company the best of luck for the future. Please Note: This sample resignation letter is provided for guidance purposes only. Resignation letters should be edited to fit your own personal situation. Are you ready for your sales job interview? These typical sales interview questions and answers will set you up for success.